The Deep Emotions Rose Bouquet showers your special recipient with affection and admiration in sun-crushed hues. 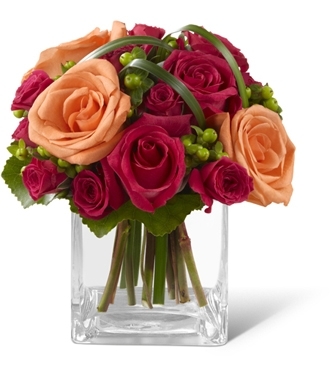 Deep fuchsia roses and spray roses share the spotlight with bright orange roses, green hypericum berries and lily grass blades gorgeously arranged in a clear glass vase. Fresh and eye-catching with extraordinary color, this bouquet will evoke warm feelings with its undeniable charm.